Through the stories of violins played during the Holocaust, now lovingly restored and exhibited, history and music come together in a story of tragedy and hope. I read and enjoyed Wild last summer but wasn’t particularly interested in Cheryl Strayed’s earlier collection of advice columns, partly put off by the minimalist cover design. Now I know I have to look into it! Insight into the pre-war Depression years, and a somewhat obscure sport. Women and espionage in the American Civil War take center stage in this entertaining yet informative read. Brona recommended this one after I focused on “Unconventional Biographies” in my initial NN post. It sounds extraordinary. I know very little about the profession of archaeology, but Marilyn Johnson can fix that. A British journalist travels to her father’s homeland in Afghanistan, in search of the country found in his stories. This “black man’s tribute to his white mother” sounds like a portrait of a remarkable individual. I should know more about this pivotal year in American history, and McCullough’s style sounds engaging enough to get me through it. I know I’ll have a great year with these, and I’m definitely looking forward to next November! Is That a Fish in Your Ear and The Paper Garden have made it onto my list as well. 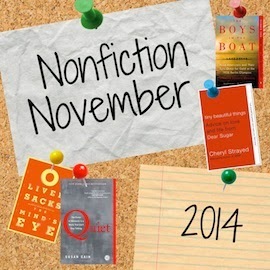 It was a great month of nonfiction, wasn't it?! It was! I'm glad to have pushed my reading in a new direction. I'm glad you've changed your mind about Tiny Beautiful Things! I read it last year and it just floored me, I loved it so much. Another recommendation I can't ignore. I will try to get to this one sooner rather than later. Hi 🙂 This has been really interesting – I feel as though too often we can focus on fiction and forget the amazing non-fiction reads that are out there. I definitely want to read "Is That A Fish In Your Ear" – translations fascinate me. Translations are fascinating, aren't they? Right now I'm working on editing some children's songs that have been translated from Dutch, and they are difficult enough. I can't even imagine trying to translate Shakespeare or Goethe or the like. I'd love to join in your readalong, have commented on your announcement post. Thanks for visiting! Wow – that's really cool! That must be really tricky too to translate the rhythms of a song … very exciting. And yes, translating Shakespeare and similar would be a monumental task! It is exciting! I'm not technically a translator, but I sometimes have to edit a literal translation to try to recapture some of the rhythm and rhyme of the song. It's tricky but also fun, kind of like a puzzle. What a great list of non-fiction books. I've read The Storyteller's Daughter, which I loved, and also The Color of Water, but I can't wait to check out some of these other non-fiction reads. Hooray, this will be fun! I'm posting an announcement on December 1. You have some good ones on your list! Happy reading. Good to know — I'll make sure to check it out soon. It looks like you've got some great books you want to get to! I loved Liar, Temptress, Soldier, Spy and Tiny Beautiful Things and am just starting Lives in Ruins. I haven't read Is That a Fish in Your Ear or 1776, but they both sound fascinating! What a great list! The Boys in the Boat is the BEST — my favorite book last year, for sure. It also was the #1 seller at the bookstore where I work. I haven't talked to anyone who hasn't loved it. I also really enjoyed Liar, Temptress, Soldier, Spy and Tiny Beautiful Things. Have a great Thanksgiving and Stay warm! Wow, that's a pretty impressive recommendation! Thanks for stopping by. I enjoyed Is That a Fish in Your Ear? and McCullough is always good. Looks like a great list! I've never read anything by McCullough, but I think 1776 would be a good place to start. Especially since I now live 90 minutes from Boston. I loved One Summer–such a great book. I haven't read 1776 but it's on the list! Viva non-fiction! Agreed — all of these look so tempting, it's hard to know where to start.